This tip showing How to Get a Clean Shower Head only takes minutes and will leave your shower head clean and germ free! 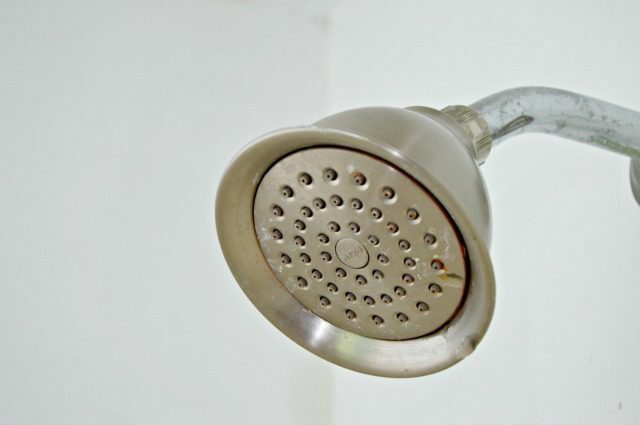 One of the items in our homes that goes unnoticed and uncleaned are the shower heads in our bathrooms. The water that comes through them is used to wash our bodies and the bodies of our children too, so one might assume that it will be clean since clean water comes out of it. Shower heads actually hold water and moisture in them in between uses and can build up all kinds of goodies like mildew, lime deposits and other germs…even fungus can grow in there. It’s a good idea to clean your shower heads at least once every couple of months at least. 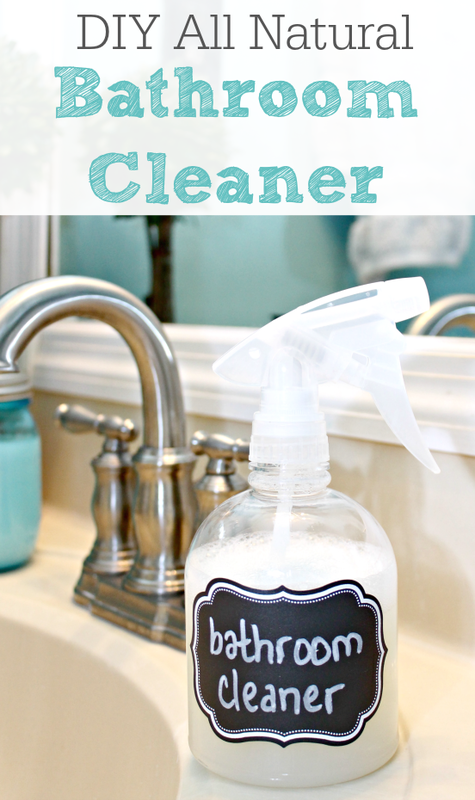 It’s so easy to get a clean shower head and you only need one ingredient! If you are anything like me, you don’t really notice how dirty your shower head is…until one day when you look up and see the discoloration or buildup. You may also notice that the jets of your shower head are shooting in weird directions, which most likely means they are clogged with mildew or lime buildup. The good news is that it’s super easy to clean with something that I bet you already have in your kitchen pantry. 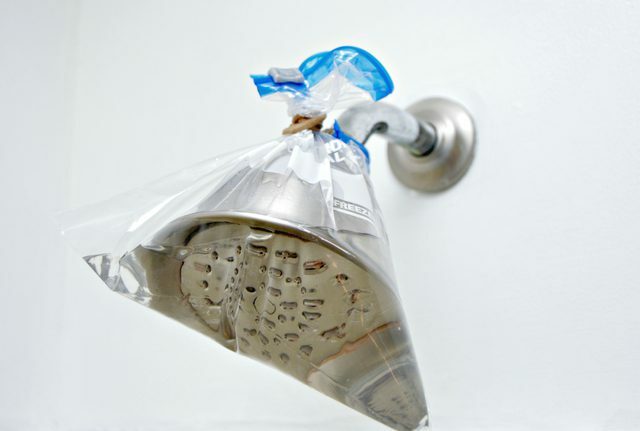 Pour the vinegar into the baggie, then use the hair tie or rubber band to secure the baggie onto the shower head. Leave on for at least 30 minutes. 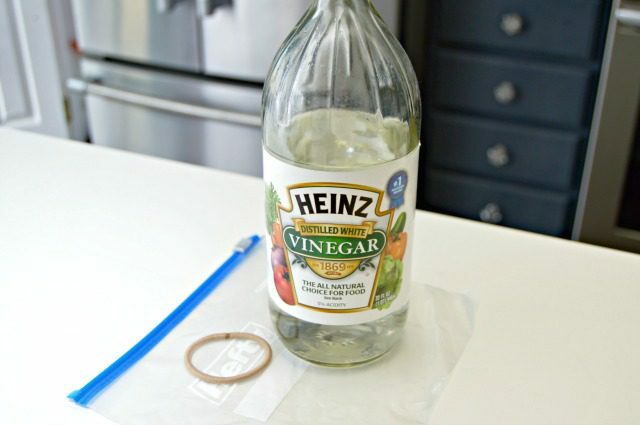 Remove the baggie of vinegar and discard. Use a scrub brush to remove any loosened debris, then rinse with warm water until all of the debris washes away. 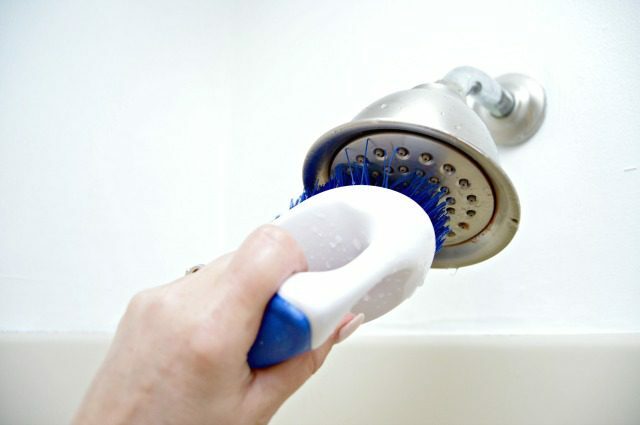 This cleaning method will leave your shower head clean and also functioning better! 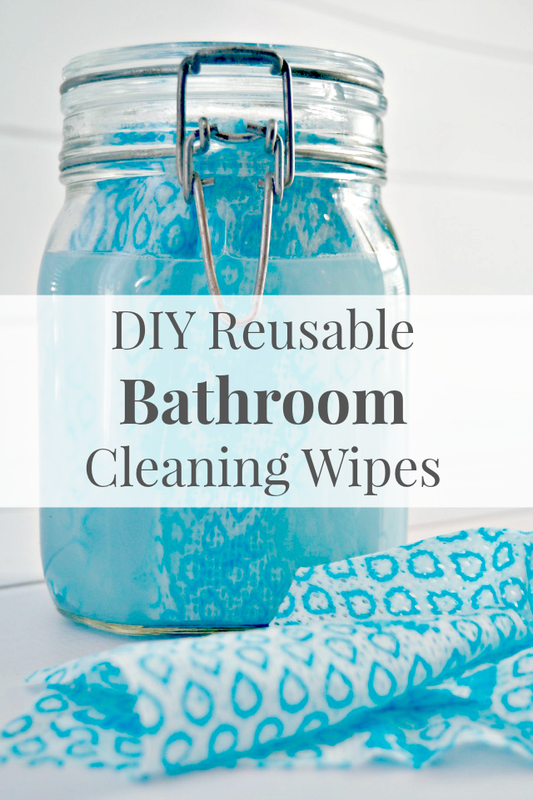 Try these DIY Reusable Bathroom Cleaning Wipes are great for wiping down sinks, toilets and countertops too! 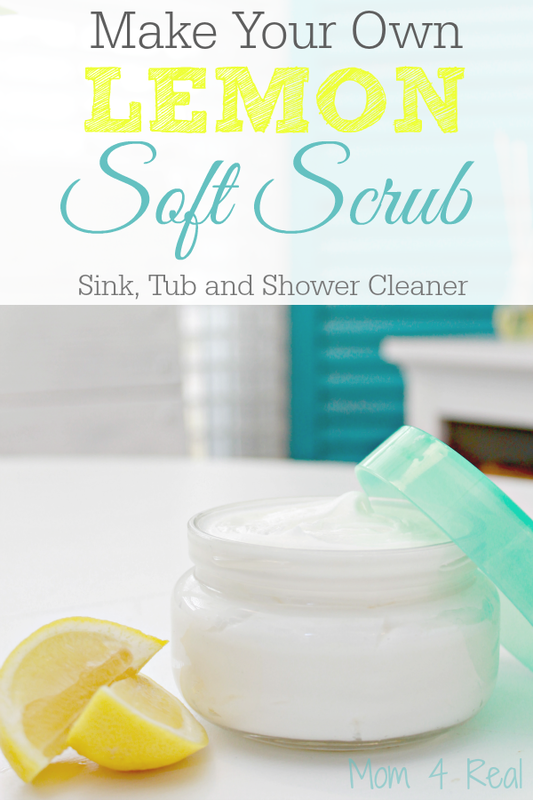 Ditch the harsh, chemical filled cleaners and Make Your Own Soft Scrub to clean sinks, tubs and showers…you will love it! Never throw a shower curtain liner out again. 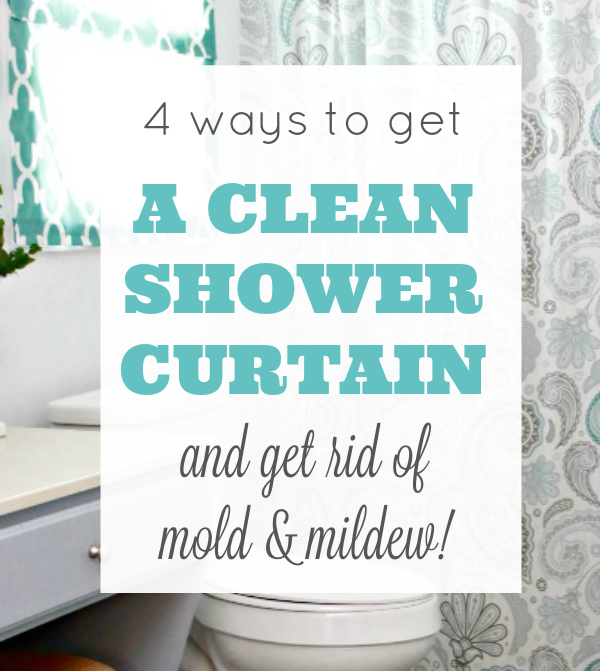 Check out 4 Ways To Get A Clean Shower Curtain and ditch the mold and mildew! 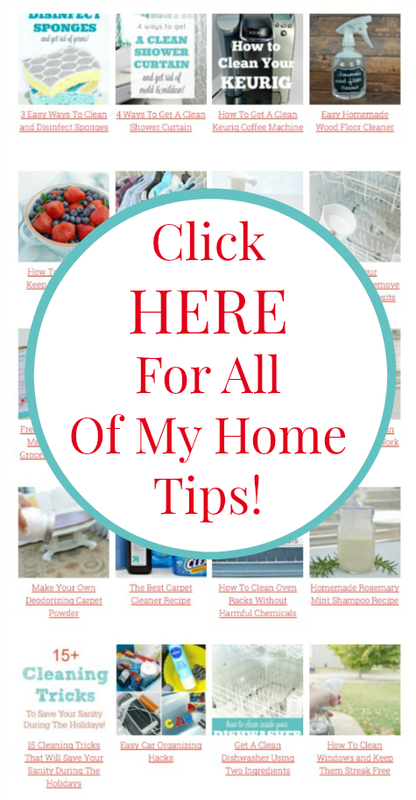 Make your own Bathroom Cleaner Spray with a few household ingredients…this stuff is amazing! Now go get that bathroom clean! How can you get stains out of a granite sink? 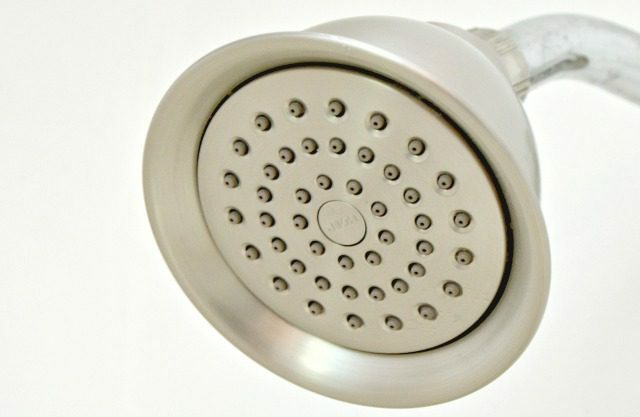 Any suggestions for those of us who have the”removable” shower heads and long tube.to connect it? I would follow the same instructions, but maybe instead of tying the baggie around it, you can just place the shower head in a bowl of vinegar. It would also probably be a good idea to remove the hose and flush it with vinegar too. Hope this helps! Someone told me to put vinegar in a bag and place over faucet overnight to a clean spout.